Home » alert » Thanks for making it a success! 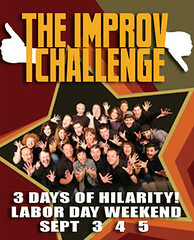 Ventura Improv Company’s beloved yearly improvisation festival did indeed kick some … well, you know. This three-day spectacular was filled with shows and competitions, and improvisers came from all over the West to participate! High hilarity by our local performers and our visitors from all over California, including the fantastic Jenn Chou from LA! Music, improv, scenes — FUN! Only one improviser will remain the King of the Hill by the end of this show. Two teams respond to the same challenges by offering up scenes, games and music! You, the audience, will act as judge and jury. Featuring Seth Brown and Holly Cervi from Los Angeles. Please note the special ticket prices for this weekend. Discounts, vouchers, coupons or special promotional tickets will not be accepted for Labor Day weekend, Sept 3-5. Saturday shows: $10/person. Get both Saturday shows for $15! To reserve tickets, call (805) 643-5701 or email. Be sure to indicate your contact information, number of tickets, and which show you’d like to reserve.